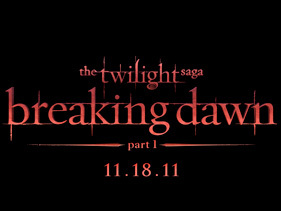 This week seems to the week of the Twilight Saga – Breaking Dawn news. Today Summit Entertainment released yet another early gift for the millions of Twihards, the official title card for the first part of “Breaking Dawn.” They are keepin the same look as the other three movies. The only thing they change about the card is the color of the font. According to Summit, each card has a unique color to reflect the tone of the story. There is such a buzz going on about the movie! This week we have seen promo pics (maybe real) and the Bella Swan/Charlie house being constructed. People are scouring the internet trying to find information on the movie. So what do you think of the color of the font – does it tell us anything about the movie and the tone?